I thought I’d check out ArcheAge, which has some great buzz and acclaim. So I downloaded Glyph and installed the game. 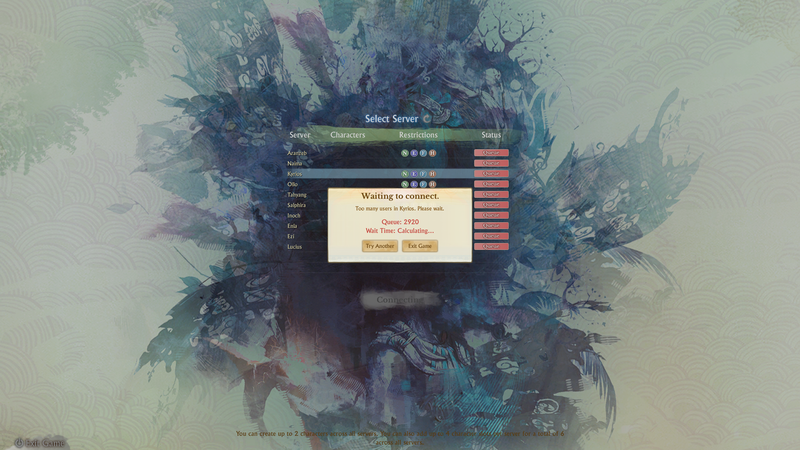 When I tried to log in, I was greeted with a queue! After digging around on the website I found and read the launch update note and they are working on it. Syncaine suggests cutting off the free players (of which I am one), which might be drastic, but then the paying customers have to get priority somehow. I don’t mind waiting until extra capacity comes along or the queues shorten a bit before trying it out. Early the next morning I was able to log in, but there were still restrictions. In the screenshot, the circled N, E, F, H means that character creation is restricted: N for Nuian restricted, E for Elf restricted (Syp would declare this should be the default), F for Firran restricted, H for Harani restricted. So… even though I got onto a server, I couldn’t create a character. Hm… so I picked another server (Ezi) with no restrictions and whipped up a character real quick, a Harani archer.